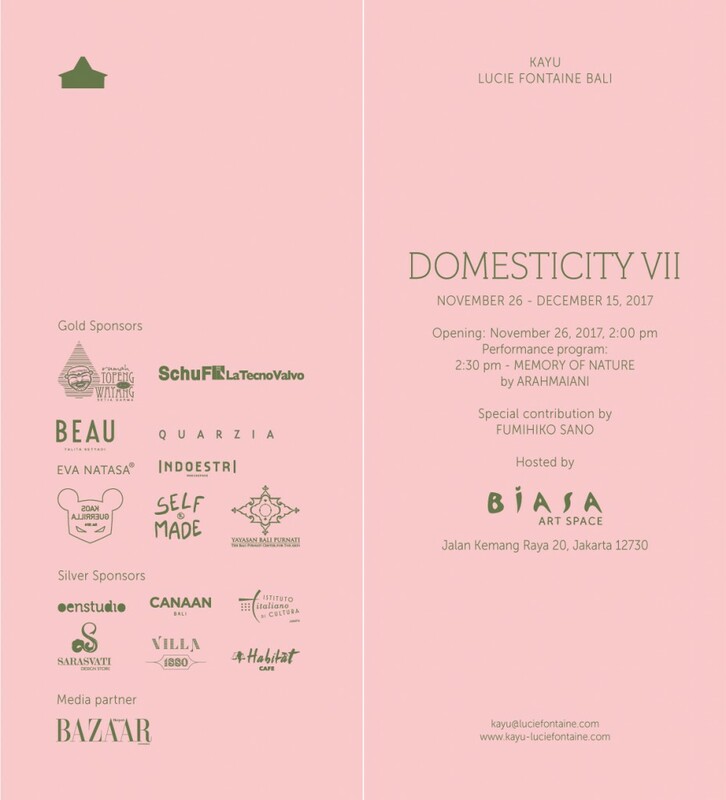 Kayu in collaboration with Biasa Art Space is pleased to present its seventh project, “Domesticity VII” at Biasa Art Space in Jakarta. This project will be on view from November 26 to December 15, 2017. “Domesticity VII” is an extension of “Domesticity VI”, an exhibition currently on view at Kayu’s premises at Rumah Topeng Dan Wayang [The House of Mask and Puppet] in Bali until December 11. The exhibition presents Arahamaiani’s work and Fumihiko Sano’s architectural intervention. It is presented as a collateral event of the Jakarta Biennale. “Domesticity VII” continues to investigate the relationship – or lack thereof – between contemporary art and domestic spaces. In particular, “Domesticity VII” wants to challenge the social and political implications behind the notion of domesticity, which is traditionally connected to women through the reflection of the relation between host (the space, male, power) and guest (female). This iteration of the project is also informed by the Asian context, linking a ‘monolithic culture’ such as the Japanese one and a ‘dispersed culture’ such as the Indonesian one. Emphasizing the notion of offering, this project would like to consider Arahmaiani’s work (a performance and an installation) as offerings to be presented within a temporary structure designed by Japanese architect Fumihiko Sano and inspired by Japanese teahouses. The work Memory of Nature (2010-ongoing) by Arahmaiani is connected to the Mandala and it is the result of an intensely research carried by the artist with the Tibetan monks. The Hindu Sanskrit origin of the word Mandala is a concentric diagram with spiritual and ritual significance; it means “essence,” “having” or “containing.” It can also be translated as “circle-circumference” or “completion.” In Bali, the Mandala is a possible representation of the universe. In this work Arahmaiani takes the shape from the basic forms/patterns of the Borobudur temple in Java in order to create Mandala-shaped sand paintings, following a technique commonly employed by Tibetan monks for special rituals. Introduced by a performance by musician Wukir Suryadi, Memory of Nature is a participatory work in which the audience is invited to create new versions of Mandala using organic materials such as seeds and soil. A contemplative and meditative work, it evokes memories of the universe.